Q: Where do we meet for the ballet class? Scottsdale/Chandler: Meet Jaclyn outside of the ballet studio 5 minutes prior to the start of the class. I ask that you please be quiet and respectful and start stretching until it is time for your class to start. Q: What do I wear to Figure Skater Ballet Class? Girls: Hair is to be pulled back off face, no dangling jewelry. Skating attire is fine for dress for this class. Dance attire is even better. Example: leotard, tights, leggings, form fitting tank top, chiffon skirts, skate dresses are all great for dancing. *Please no over-sized clothing…hoodies, baggy sweatshirts, loose t-shirts, and sweatpants make it very difficult to see the alignment and placement of the body. Boys: Skate attire is great. Dance attire is great. Shorts are fine. I need to be able to see knees (keep that in mind). T-shirts are fine. Ballet shoes are required. Q: How much does the ballet class cost, and how do I pay? $15 through skater-ice. $17 to drop in. Please pay at the front desk of the Ice Den, or through Skaterice online. Q: Does Ballet really enhance a figure skaters’ performance and on-ice technique? Absolutely, Yes! As a skater progresses they will be focusing on details that relate directly to ballet technique. There is a need for extension of body lines. A skater must have flexibility while maintaining proper body alignment. There is an importance in the quality of transitions from one movement to the next. A skater has to develop strength and appear confident. In a ballet class, a skater will work with classical music and learn how to move to different tempos. Musicality is vital to a figure skaters performance. In ballet class skaters learn to count the beats of the music, and they also learn to focus on style, emotion, and expression. Ballet technique will carry over into their skating which establishes a dynamic and artistic quality to their on ice presentation. Q: What is it specifically that is taught and practiced in ballet class that relates to the specific elements on the ice? Posture: A skater needs a strong core to connect the upper and lower body. As I tell my skaters on a daily basis, the arms and upper body are two different pieces, they have to move entirely separate. The power and strength is in the lower body, the elegance, stability and grace comes from the upper body. The “core” is neutral- controlling all. A skater has to be able to maintain proper alignment, keeping shoulders over hips during jumps, spins, footwork, and edges. In skating the core also has to be able to work opposite, taking the shoulders against the hips (ex: mohawks, 3-turns, rockers ) Posture involves not only staying square, but also twisting. What exactly is correct posture? It is a neutral spine with the shoulders over the hips. The lower abdomen is lifted. One of the largest benefits to a skater is working at a ballet barre. The barre training helps to stay aligned while moving isolated body parts. Ballet teaches the skater how to move while staying balanced, with a strong core. Shifting weight, and maintaining balance in a ballet class, allows the figure skaters to understand and become very aware of their body placement and posture. Balance: Balance is critical to a skater’s alignment. A skater’s quality on edges, footwork, preparations for jumps ,and keeping control of balance while rotating in spins depends on their balance. Ballet class takes positions and stretches and will balance them on either a flat foot, or on a releve (on the ball of the foot). Balances can be done on one foot or two feet. The transfer of weight and alignment of the body improves balance both in the ballet class and on ice. Placement, Power, Quickness: All of these are addressed in ballet classes through basic skills such as plies, tendus, degages, frappe, fouette and grand battement. These movements teach the basic “snap through the hips, knees, ankles and feet” used for skating basics such as power for stroking, pushing through the feet for jumps and agility in quick footwork. Q: What regimen is recommended for cross training with ballet, to make a noticeable difference on ice? A figure skater’s training schedule typically consists of skating sessions that occur before school, and after school. It is very difficult to find time for ballet classes at a local studio to fit in with the skater’s skating schedule. I am able to bring ballet to the figure skaters. For the past 4 years I have been paying very close attention to who has made the most progress. 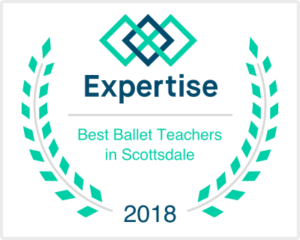 I have found that when a skater does a group ballet class, and a group extreme stretch class (both of which are offered on the weekends at the Ice Den, Scottsdale), a private “in-studio” lesson to work on technique, form, musicality, and presentation in front of mirrors, and also a “side-ice” lesson to work on arms and heads and to make sure the studio elements are transferred to the ice, all on a weekly basis; ballet becomes 2nd nature to their skating. The outcome is visible to even the untrained eye. Typically, the comment made is “the skater looks so light and graceful” especially in comparison to a skater who doesn’t take ballet at all.